This synthetic brush is invaluable for blending and softening. When used wet it can transform paint effects. The synthetic softener produces similar effects to the Badger hair softeners, and if properly cared for will last a lifetime. 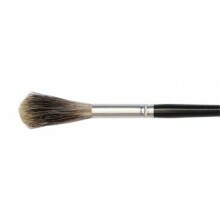 This brush is one of the most essential brushes for painting authentic faux and custom decorative finishes. Its softness reduces harsh edges between colours, blending and softening the unnatural edges from your work. The stroke is extremely light, almost tickling the surface with the tips of the hair. You should use your arm from your elbow to maintain an even stroke over the surface. Avoid brushing with only your wrist as this tends to be quite irregular, even with the lightest touch.